The NovoVerse NUI Galway student undergraduate research eJournal is now accepting submissions from undergraduate students. 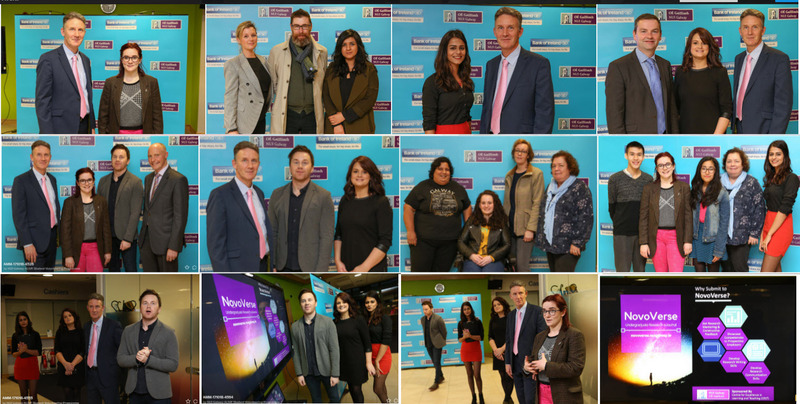 The announcement was made at the NovoVerse launch party which took place on Wednesday October 18th at the Bank of Ireland University branch. We here at NovoVerse would like to thank Ailish Gorman, Bank of Ireland student officer, for hosting our launch event. We would also like to thank all of the attendees and representatives from the NUI Galway undergraduate research conference for creating such a warm atmosphere. In line with our motto: You’ve already done all the hard work so submit your research today! Click here for the full NUI Galway NovoVerse Press Release. Click here for more launch party photos.